Dec 5, 2018: The Mahindra Bolero Maxi Truck Plus is much like the single cab variant of the Bolero Camper Gold. However, since the additional cab size has been removed, the loading capacity is bigger. The gross vehicle weight of 2,620 kilograms makes for a maximum payload capacity of 1,255 kilograms. But since it is a D+1 single cab version, it loses out on the air conditioning. For the braking, there is a similar setup as the other sibling and is comprised of disc brakes for all corners. However, the suspension is handled by rigid semi-elliptical leaf springs instead of the anti-roll bars. The power is supplied from the same 2.5-litre four-cylinder motor that can produce 63 bhp of power at 3,200 rpm and 195 Nm of torque at 1,400 rpm. The biggest commercial trucks maker in India, Mahindra & Mahindra had launched the extra long city Bolero Maxi Truck Plus in September 2017. It carries a price tag around Rs. 5.24 lakhs and has a BS IV-compliant engine. The performance, reliability, profitability and comfort, everything is up to the mark. The manufacturer is basically known for the reliability and style, though a lot of other features make the vehicle the perfect city pickup. It can easily carry heavy loads, without compromising on the mileage. The truck gets a large cargo deck along with an excellent chassis setup to give you the convenience while carrying heavy loads. Moreover, it gets an optional power steering, which makes the effort of the driver to turn in city lanes lesser. Also, the turning radius of the vehicle is pretty decent and the driver can turn even in narrow lanes with ease. The Mahindra Bolero Maxi Truck Plus is one of the best pickup trucks and gets a powerful engine under the hood. It is equipped with a 2.5-litre m2DICR turbocharged, BS-IV compliant engine which is good enough to deliver quality performance. It is capable of belting out a maximum of 63 bhp power and the peak torque sticks at 195 Nm. The maximum power comes at 3,200 rpm, while the peak torque comes at a range between 1,400 and 2,200 rpm. The power is sent to the wheels via a 5-speed manual gearbox, with the assistance of a single-plate dry clutch. The engine can drive the truck to a top-speed of 115 kmph. It comes with an axle configuration of 4x4, which also contributes to the powerful performance and better off-roadability. The fuel efficiency of the pickup lies at around 17 litres. 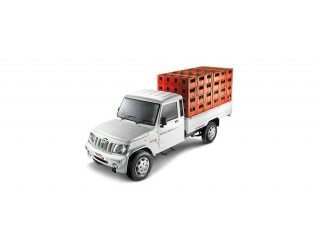 The Mahindra Bolero Maxi Truck Plus comes with a customizable body. It has a length of 4,885 mm and the width is around 1,700 mm, while the height is 1,825 mm. It carries a fuel tank of 45 litres. The maxi truck is quite good to carry mid-weight loads. It comes with a gross vehicle weight (GVW) of around 2,620 kilograms, which makes sure that the payload capacity is decent. It has a luggage carrying capacity measuring 1,255 kilograms, while the kerb weight is 1,365 kg. The handling of the Mahindra Bolero Maxi Truck Plus is at par with any other pickup trucks in the segment. Power steering is optional and its addition makes handling the maxi truck easy and convenient. Driving in a bit of off-road conditions will not be a hassle anymore as the truck has decent ground clearance. Hence, the drivers can take on the light bumpy roads without worrying much about the damage. The pickup truck gets semi-elliptical leaf spring unit for both the axles for the suspension. Having a similar setup at both ends makes the suspension stiffness or softness uniform and not very uneven. The Mahindra Bolero Maxi Truck Plus comes with disc brakes for all the wheels. The brakes offer a good stopping power. This means, even if the driver is speeding up in cities, pressing the brake pedal will be enough for rapid deceleration. The vehicle also comes with parking brakes for more convenience. However, the absence of the ABS might be a problem for the driver. The pickup truck gets seatbelts in the D+1 cabin. Moreover, tubeless tyres are offered to make the grip excellent. The Mahindra Bolero Maxi Truck Plus gets a bold design along with a long wheelbase. It comes with a customizable body along with a decent cabin. All the 15-inch wheels are wrapped in 195-section tyres. The pickup has a good design as well and looks way better than other mini trucks from Tata or Ashok Leyland. The design of the headlamps is quite eye-catchy and the pickup looks muscular from the front to the rear. Inside the cabin, there is a stylish dual-tone instrument panel and the door trims have matching fabric seats. Furthermore, the vehicle comes with an optional power steering along with a tiltable setup. The driver’s seat can be adjusted as per the ergonomic requirement.